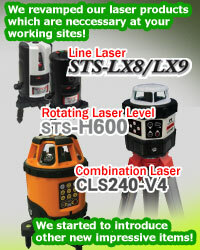 Manufacturing and selling of surveying instruments and other laser tools. 1. Developing a unique sales channel both at home and abroad. 1. Making efforts to create new products all the time. 1. Keeping fairness and ambition in mind, aiming to promote a company growth and improve our living condition.